On the morning of 10th October some 16 members, family & friends set off in individual carloads leaving at varying times to suit each group, to Hooton station where we caught Merseyrail transport to Liverpool. It was a lovely sunny day so with our rendezvous time at The World Museum fixed for 1.45 for the 2pm tour of the exhibition, various small groups went their own way in the city and ‘did their own thing’ which included refreshments for many and an energizing city walk for some. The exhibition fitted into one floor of the building, ingeniously designed to walk us through the history of the time and location, with a progression of the items on display. The whole area was dark, largely black backgrounds, with some striking scarlet, but the exhibits were well lit. 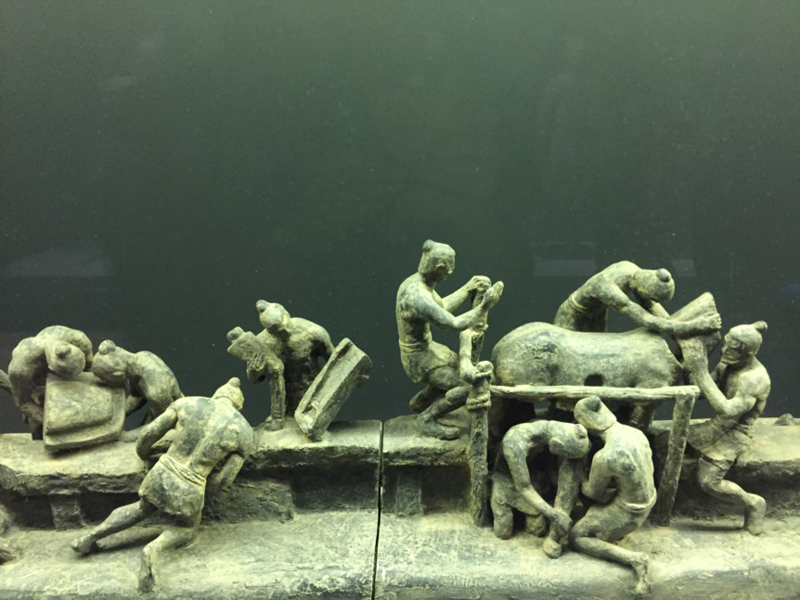 There were many information boards, some at a rather low level which meant queuing and bending to read them, so progression was slow but outlined the life of Qin Shi Huang who became leader of the Qin/Chin’s aged just 16 and then designated himself the First Emperor by conquering his neighbouring tribes, aged 27. He died at 51 in 210BC. As is now well known, farmers were the first to discover the tomb and some of the grave goods and over many years much more has been uncovered and researched. In the exhibition some 180 artifacts were set out for view and included a considerable number of elegant and intricately made metal items, many urns and containers, as well as pottery and other precious items; 2 carriages with horses perhaps a third of the size of the real items, and after all these some 6 different warriors. (These had been transported without their heads but were of course whole when we saw them). On the opposite wall to the warriors there was a long case showing the whole sequence in miniature of how the clay had been prepared and the horses and warriors made. Throughout the exhibition information boards had given a background to the political situation played out during the First Emperor’s lifetime and the subsequent turmoil and necessary political readjustment in the years following his death. The final part of the exhibition showed items from the tombs of later Emperors. With so much on the television about the warriors it was hard to imagine how the reality of seeing the items could be so impressive, but it was. It was a stunning exhibition, and a massive undertaking to present these items to the public. Many thanks to both Ro and Pat for obtaining the tickets and organizing the group. It was a great day out, but an education too! Any concern at having 4 unused tickets was wiped away as we stood at the ticket office trying to return them – some Utah tourists eagerly snapped them up and became members of our group for the visit.